Samsung UE40D5520 review | What Hi-Fi? 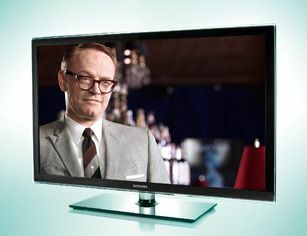 If there’s one area of TV manufacture where Samsung has established itself as a front runner, it’s perceived value. Take this UE40D5520. It’s a touch more expensive than its Sony and LG rivals, but it looks svelte and modern where the Sony KDL-40CX523 looks dated, and it’s bang on the money, spec-wise. The lack of 3D support might drive some into the arms of LG’s 42PW450, but in every other respect the Samsung is the most accomplished sub-£1000 screen we've tested. Full HD resolution, Freeview HD tuner, wireless networking with the purchase of a dongle, a chassis depth of less than 3cm, a host of Smart TV online functions (BBC iPlayer, LoveFilm, Twitter and so on), spotless ergonomics and a remote control you don’t have to study at length before use. These are all good reasons to investigate D5520 ownership. Set-up is simple; soon the set’s ready to serve up pictures. The D5520 then goes from interesting to compelling. The Samsung’s at its most equivocal when upscaling DVDs, and even then it does impressive work. The colour palette is wide-ranging, subtle and entirely believable, and clean, bright whites coexist happily with deep, detailed black tones. Detail levels in general are high, motion is handled with confidence in all but the most trying circumstances, and edges stay smooth throughout. Switch to the integrated Freeview HD tuner and performance steps up a notch or two. The colour palette is brilliantly judged, allowing delicate gradations without robbing any vitality from stronger tones, textures of all kinds are convincing, and movement is described with even greater solidity. Black shades incorporate plenty of information (and this Samsung is capable of describing black variations better than any price-comparable rival), and picture noise is, at worst, little more than a rumour. Even the most testing broadcasts, such as the BBC’s coverage of Formula One, are delivered with certainty and consistency. At the top of the heap, in quality terms, is Blu-ray; and here the D5520 confirms just what a class act it is. Clean, detailed and rock-solid, the Samsung’s pictures are all but free of picture noise. They enjoy the crispest of edges and truly excel at putting strong, bright whites in close proximity to lustrous, detailed blacks. Perceived depth of field is tremendous and skintones life-like. In addition to all this, the Samsung is very dark indeed when idling or displaying one of those interminable Blu-ray ‘loading’ pages. That speaks volumes about the efficiency and consistency of its LED backlighting. In fact, the best we can do to fill the ‘demerits’ column is to point out that it sounds quite thin (though also usefully spacious) and that it’s not as good to watch when you’re sitting off-axis. Otherwise, there’s no reason in the world not to put the UE40D5520 right at the top of your shortlist.